Lakewood Auto Body is a respected auto body repair shopserving the residents of Steilacoom, WA since 1962. We're a family-owned company specializing collision repair, mechanical repair, frame straightening, and any auto body needs you may have for your Steilacoom vehicles. At Lakewood Auto Body, we have an outstanding team of experienced and competent collision repair specialists that can provide Steilacoom residents with all kinds of auto body repairs, from a vehicle scratch to a total collisionrepair. Our technicians are experienced in collision repair for all major makes and models of cars and trucks. Accidents are regrettable occurrences that can cause bodily injury as well as vehicle damage. We can’t help with your aches and pains, but we can do our best to give you back your vehicle looking like new again! As a premier collision repair shop for Steilacoom residents, our highly-skilled and trained mechanics and technicians are available for any auto body repair needs you may have. 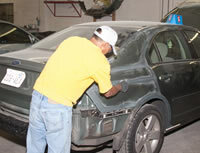 Why choose us for Steilacoom auto body repair services? For 50 years, Lakewood Auto Body has been providing collision repair solutions, and has become the most dependable and respected auto body repair shop for Steilacoom, WA. We use the technically advanced Shark electronic measuring system and Bee Line frame racks to make sure that ourauto body repair services start with the best equipment. But it is our commitment to first rate customer service that makes us Steilacoom first choice for auto body repairs!